A team of senior Government officials has been tasked to work on an omnibus Constitutional Amendment Bill that will deepen civil liberties, individual rights, scrap the death penalty, extend the women's quota system and entrench political and electoral reforms. In crafting the political and electoral reforms, the team, which is working under the aegis of the Inter-Ministerial Taskforce set up last week, will feed off from recommendations made by the various election observer missions during last year's harmonised elections, the Motlanthe post-election violence report and input to be generated from the ongoing inter-party dialogue. Justice Legal and Parliamentary Affairs Minister Ziyambi Ziyambi told The Sunday Mail last week that the envisaged Bill will be comprehensive as it will also cover devolution and the political rights of chiefs. "I chair a committee on Political and Electoral Legislative reforms and we are working to come up with a Constitutional Amendment Bill that takes care of all the constitutional amendments that we might want to do," said Minister Ziyambi. "This involves issues to do with devolution, where we have this idea of MPs not sitting in Provincial Councils. "We are also looking at issues to deal with the idea of extending the women's quota in Parliament. "We will also initiate debate around the death penalty, and we will also initiate debate on political rights of traditional chiefs. "We have conflicting provisions, where Section 67 gives everyone political rights but we also have another provision which says chiefs should be apolitical; we will look at ways of harmonising this. "We will definitely have to amend the Constitutional, but we want to bring all the provisions under one Bill," he said. Minister Ziyambi, who chairs the taskforce, is deputised by Foreign Affairs and International Trade Minister Dr Sibusiso Moyo. The high-level team will also fast-track legislation will enhance the ease of doing business and repeal laws that are inconsistent with the Constitution or previous court judges. Already, Cabinet has approved the repeal of the Public Order and Security Act (POSA) and the Access to Information and Protection of Privacy Act (AIPPA). The repeal of AIPPA will give rise to three legal instruments — the Access to Information Bill, the Zimbabwe Media Commission Bill and the Protection of Personal Information/Data Protection Bill. Similarly, the Maintenance of Peace and Order Bill will substitute POSA. Last month, political parties that fielded Presidential candidates during the July 30 harmonised elections convened to establish a framework for inter-party dialogue, which platform will also be used as a conduit for recommending political and electoral reforms. Interestingly, the MDC-Alliance, which has been clamouring for political reforms, has elected not to participate in the dialogue, while four parties – the Alliance of People's Agenda, United Democratic Alliance, Build Zimbabwe Alliance and People's Progressive Party of Zimbabwe – have since dropped out. Minister Ziyambi also said the team is not prioritising the creation of a formal "Office for the Leader of the Opposition", but will only consider it when it is recommended. "We have not discussed that as a committee. "When our working-party committee has done its job, it recommends that it be created at that stage; that is when we will look into that. "It is something that we have not been pushing in earnest and if it comes up, it will need an amendment to the Constitution, but at the moment, we are still discussing." Government, he said, is lagging behind the legislative schedule owing to delays in confirmation of election results. 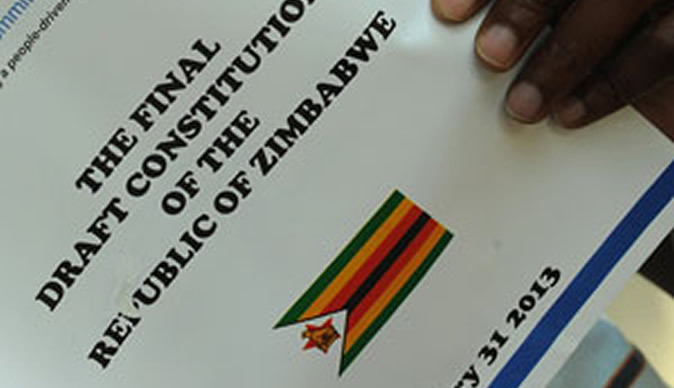 After the July 30 harmonised elections, the Constitutional Court made a ruling dismissing the election petition made by the MDC-Alliance on August 24. Last year, President Mnangagwa laid out the legislative agenda that contains at least 27 Bills that are expected to be brought before the Ninth Parliament. Ten Bills have either been approved by Cabinet or have since been tabled before the august House. Added Ziyambi: "We have to finish the alignment process this year, so the flurry (of Bills being gazetted) is a result of the fact that we have agreed to finalise the remaining pieces that need to be aligned. "Also because of our political and economic agenda in terms of the TSP (Transitional Stabilisation Programme) and Vision 2030, if we don't act fast, it means our Agenda 2030 and TSP will be derailed. "So we need these pieces of legislation to be done expeditiously in order to realise our goal. . .
"We are really under pressure to make sure that all the legislation to do with the ease of doing business to support our TSP and Vision 2030 is in place much earlier." Other members of the taskforce include Ministers Monica Mutsvangwa (Information, Publicity and Broadcasting Services), Professor Mthuli Ncube (Finance and Economic Development), Cain Mathema (Home Affairs and Cultural Heritage), Mangaliso Ndlovu (Industry and Commerce), Owen Ncube (Minister of State for Security in the President's Office) and Attorney-General Mr Prince Machaya.